NagoyaHammer.com • View topic - The Astral Hammers - NH's custom chapter. The Astral Hammers - NH's custom chapter. Re: The Astral Hammers - NH's custom chapter. Inquisitorial Seal: - Acer 9 B Dafor. Excerpt Attached: - The Indomitus Crusade, A Later History. The Battle for Taloran Prime has been a source of some controversy among Imperial strageists, due in some part to the breakdown of traditional tactics and the unorthodox way in which the closing stages of the battle were fought. The Orkoid hordes of Waaagh Guzbekk had made planetfall on Taloran sometime in 023.M42 and had proceeded to lay waste to the hive of Taloran South. Using the local populations as slave labour and the hive itself as raw material, Guzbekk's horde had constructed a vast fleet of war machines by the end of Taloran's long, harsh winter. With the coming of the thaw, Waaagh Guzbekk threw itself against the defenders of Taloran Gate. Despite having time to create a solid defensive line and reinforcements from nearly a dozen Astra Militarum regiments, Taloran Gate fell swiftly. As the battered Imperial forces withdrew Northward across the vast dust fields of the Northern continent, only a valiant rearguard by the local PDF troopers, since commemorated as the Angels of the Gate, allowed them to break contact and regroup. The arrival of the Van Gothen Armoured Regiment brought a brief glimmer of hope. Lord Miltant Dorial mustered what forces he could and launched a classic pincer assault on the Orks as they advanced out into the dust fields. Spearheaded by the Van Gothen's heavy armour including 3 whole squadrons of Stormhammer super heavy tanks, Lord Dorial hoped to crush the Orks between the two arms of his assault. As the Van Gothen armoured forces, backed by the majority of three mechanized infantry regiments ground slowly forwards, a massed horde of Ork bikes, buggies and trukks shot forward between the closing arms of the pincers. Splitting in two, the Orks encircled the Imperial advance as hundreds of thousands of Ork boyz stormed from the ruins of Taloran Gate hive into the path of the oncoming armour. With their lines of supply and communications cut, the Van Gothen armour fought valiantly until they had expended their last rounds. Stubbers clattered empty and empty breaches clanged shut on red hot battle cannons. As power klaw armed Nobz carved open the hulls of tanks which had emerged victorious across a score of battlefields, Major Sa'am, the last ranking officer of the Van Gothen Regiment gave the order to fall back. Using his Stormhammer as a battering ram, Major Sa'am opened a gap in the Ork lines, allowing those tanks and personnel carriers still mobile to escape the trap. Harried back across the barren landscape, only a tenth of the Imperial spearhead made it back to friendly lines. In less than nine hours of fighting, the greater part of Taloran's defenders had been annihilated. As the Orks made sport of the captured tank crews and scavenged the wrecks for fuel and ammo, the warriors of Taloran began to prepare themselves for a last stand. It was at this stage that help arrived from an unexpected quarter. The Astral Hammers battle barge Bastion of Will arrived in the Taloran system carrying a full battle company of the newly formed chapter. Commanded by Captain Tenabran, the third company of the Astral Hammers landed at Taloran Prime along with a small contingent of Tech Priests from the Forge World of Mundatus. Captain Tenabran sought an immediate meeting with Lord Miltant Dorial and his chiefs of staff. The contents of the meeting were sealed under the Lord Miltant's authority, so details of what was discussed are scarce. At the conclusion of the meeting, Captain Tenabran had assumed overall command of the defence of the main route to Taloran Prime. Lord Dorial and his entire command structure departed to defend the Argavial Agri-vats and Hydro-farms along the western coast. While a relatively minor site, the Argavial region was essential to the long term survival of Taloran Prime's populace. The most direct route from Taloran Gate to Taloran Prime was through the Yupsan Valley. A vast chain of mountains separate Taloran Prime from the dust fields, with the Yupsan Valley the only way through the mountains for hundreds of kilometres in either direction. At it's narrowest point, the Valley was a mere 800 metres across and formed a natural choke point. It was here that Lord Dorial had been planning his defences. Instead Captain Tenabran began construction of his own defensive line in the centre of the valley, where the pass widened out to a little over 17km. The remaining defenders of Taloran were set to work creating a series of overlapping walls and redoubts on a small ridge in the centre of the valley. Van Gothen tanks which were immobilised due to engine or track damage were lowered into deep pits until only their turrets were visible, forming small pill boxes. The men of the Heraklean 9th and 11th were stationed inside the defensive works along with the majority of the 3rd Battle Company of the Astral Hammers. In all, the defensive perimeter covered just the middle third of the Yupsan Valley. Throughout construction of the defenses numerous Imperial officers and allegedly some of the Astral Hammers squad leaders voiced concern that they would be unable to prevent the Orks from flanking their positions and leaving them cut off and the hive defenseless. It is a testament to Captain Tenabran's force of will and his men's trust in him that he was able to get the defenses completed on time. As the last of the rock-crete barriers were being pushed into position, the Orks of Waaagh Guzbekk entered the Yupsan Valley. Proceeded by untold thousands of light vehicles and trukks packed with wild eyed Orks, the Waaagh crashed forward like a great green wave. As the first of the Ork vehicles neared the Imperial defenses it exploded into fragments and cartwheeled through the air. Mines had been placed beneath the ash and silt that covered the valley floor. Inactive until triggered by a remote signal, the vanguard of the Ork horde found itself riding over a mass of explosives. Shards of metal, green skinned limbs and plumes of dust were kicked high into the air as the mines detonated in a rippling crescendo of violence. Bloodied, but unwilling to surrender, the Orks split in two, washing around the sides of the Astral Hammers' bastion. The faster vehicles in front sped deeper into the valley while the slower infantry forces behind moved to fill all of the available space between the mountains and the fortifications. Behind all of them, the ground trembling with each mighty step, loomed three of the Ork's god machines. Gargants, constructed from the remains of Taloran South's great walls, strode into the valley. Vast horns on their sides sounded deep, bestial roars and their guns fired wildly into the air as their crews went wild with the anticipation of the carnage they would unleash. A spear of light, blinding in it's intensity cracked downward from the heavens. Clouds roiled and the shockwaves of the blast were felt deep in Taloran Prime itself as the Bastion of Will unleashed a lance strike at the entrance to the Yupsan Valley. Forced together as they passed into the narrowest part of the Valley, the three Gargants were obliterated by the discharge of the battle barge's main guns. Designed for destroying battleships, the Gargants may as well have been ants beneath the intensity of the lance strike. As the flare from the weapons fire died away, the Orks far enough from the blast could only look on in dismay as the remains of the unholy effigies collapsed into a vast bubbling crater of molten steel and rock. As one, they turned back towards the Astral Hammers and their Militarum allies and bellowed their hatred in one long blood-curdling Waaagh. By now, the bastion was completely surrounded, the Orks circling, looking for a way in to deal death to their enemies. Captain Tenabran stood tall atop the central redoubt of his fortress and unleashed the final stroke of his plan. From camouflaged positions on the slopes of the mountains lining the valley, Hydra flak batteries from the Lucent 18th Anti-Air Corps opened fire. Their barrels depressed as low as possible, the heavy autocannons reaped a fearsome toll along the Ork flanks. Since the moment of their arrival, the Tech Priests of Mundatus and the Astral Hammers own Tech-marines had been hard at work within Taloran Prime. Long abandoned macro batteries had been refurbished and reanointed and now they added their fury to the maelstrom surrounding the bastion. Artillery observers on the peaks and Reiver squads prowling the feet of the mountains called in precise targetting locations, directing massed volleys of ordnance wherever the Orks clustered together. The remaining Van Gothen armour, along with Astral Hammers dreadnoughts and Repulsor tanks advanced from the foot of the hive. Militia and hive gangers followed in their wake, finishing off any survivors and torching their bodies with burning prometheum. Despite catastrophic losses, the Orks were not yet finished. With a triumphant roar, the Orks found an entry pointy into the bastion. Covered in minor wounds and riding a warbike scorched black by weapons fire, Guzbekk himself led the charge up into the defensive position. Awaiting him were Tenabran and a squad of Intercessors. Hunching low over his handlbars, Guzbekk gunned his engine and launched his warbike forward into the hail of bolter fire unleashed at him. With shells ricocheting from the hull of his bike, Guzbekk couldn't see the final part of Tenabran's defenses. A simple pit, concealed behind a slight rise in the ground, swallowed Guzbekk and his bike in an ear-splitting crash. Tearing himself free of the wreckage and with one arm hanging by just a few remaining tendons, Guzbekk dragged himself free of the pit. Captain Tenabran was waiting. Thunder Hammer crashed against Power Klaw as the two opposing leaders settled their battle at close quarters. With a shout of triumph Tenabran lifted Guzbekk's broken corpse over his head and pitched him over the parapets of the bastion. What remained of the Orkish hordes began a headlong rush towards the exit to the valley and safety. This time it was the triumphant forces of the Imperium who harried the retreating enemy. Astral Hammers gunships strafed the fleeing greenskins as medics and apothecaries began their work on the wounded soldiers and marines who had manned the defenses throughout the battle. In later years, a statue would be erected over the site of Tenabran's bastion. Taloran children learn the tales of the heroic defense of their hive and the reconstruction of Taloran Gate has begun. The 3rd Company of the Astral Hammers stayed on Taloran for a further 18 weeks conducting mopping up operations across the planet before leading the assault on Taloran South to eradicate the Ork base their and avenge the populace. Those flak batteries were a nice touch there sir! And of course Captain Tenabran smote the Xenos with a mighty hammer - it is only fitting. Nice work, Prim and Kbear! I'm trying to get to grips with the details of the chapter - it's been ages since I read any space marine-y fiction, and getting a handle on the tone of it is proving tricksy for me. I'll come up with something at some point, though, I'd hope. Anyway - very well done, lads. A tip of the hat to each of you. So I started painting up a Hammer. Probably won't get a chance to finish him off until the weekend though. Great! 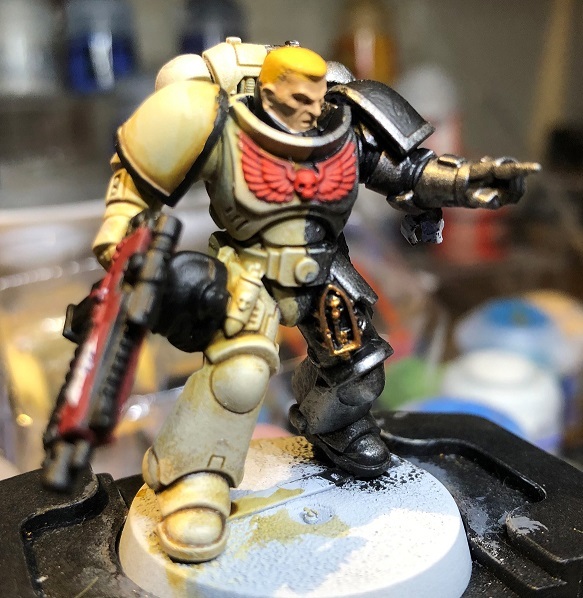 I'm looking forward to seeing him all finished off and ready to smite some heretics and/or xenos. Anyone else working on these guys? Anyone with some more fluff to add? I'm waiting for an excuse to break out the gunmetal spraypaint to get started on mine - while Leadbelcher is some awesome stuff, at 2000 yen a can I don't want to spray just one guy. And I don't have much of a hand for fluff-writing, but I am percolating some ideas. Maybe we could buy a cheap squad offa eBay and share em out? I've got one left from the three-pack of easy-builds I bought - but yeah, Dark Imperium box contents are verra cheap these days on eBay.